Many people use their garage disposal every day and depend on it to work. 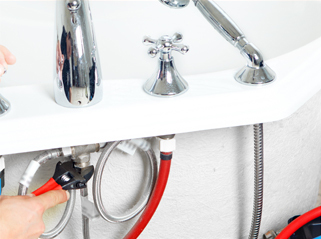 From time to time, your disposal will malfunction or breakdown and will need to be repaired or replaced. One of the most common reasons is a clogged or blocked disposal. When this happens, the problem should be addressed right away. If your disposal is clogged with food items, coffee grains and other debris, we highly recommend that you stop using the unit immediately. If you continue to use the disposal, the motor could burn out and the unit could fail to operate. We are a high quality Garbage Disposal Repair in Scottsdale, AZ, company that you can trust, so contact us today. Loud noises or sounds when the unit is in use also indicate that there is a problem with your disposal. Typically, loud or strange noises mean that the disposal will need replacing because the blades are probably broken. We have been in operation for decades and know what we are doing. Our technicians are well trained and highly experienced and will know what to do. If your disposal needs to be replaced, you can count on our first-rate Garbage Disposal Repair in Scottsdale, AZ. If you observe standing water under your sink, it is most likely coming from the disposal. Excess water can cause mold to grow, which could cause breathing difficulty and other health problems. Our skilled technicians are the best in town and will complete a thorough inspection to find the source of the leak and will correct the problem. We a very reputable company that you can trust and that will not be beat. If you want the best Garbage Disposal Repair in Scottsdale, AZ, we advise you to contact us today to schedule an appointment.